Please Read Carefully our Terms and Conditions of Rental. Although we try to keep them as simple and clear as possible, please don't hesitate to contact us if you require any clarification. Our Booking Reservation system presents you with real-time vehicle Availability. You can select your desired vehicle-group and proceed to booking confirmation. Upon completing your personal details you will be presented with the following payment-confirmation options. Please note that your Credit Card will be charge only if the booking will be confirmed. The remaining amount can be paid by either Credit Card or Cash upon collecting your vehicle. With this option you can secure your booking until 14 days before the start of the rental and you can then pay by one of the above methods. The vehicles displayed and models listed are the most common vehicles in the category. We will provide you with either this car or similar cars in size and engine type. We cannot guarantee that the make or model of the rental vehicle will be the same as the vehicle displayed on our website. Upon request we may be able to provide you with specific model. Your voucher must be produced on arrival at the rental desk. Failure to present your voucher means we cannot be held responsible for any additional charges. In the event that you fail to present a valid credit card, you may be refused to collect the vehicle. In these instances, no funds paid will be reimbursed. If the booking is cancelled within 7 days of the car rental booking date and at least 48 hours before pick up time, all funds will be reimbursed. If the booking is cancelled outside 7 days of the car rental booking date and at least 48 hours before the pickup time, all funds except a cancellation fee of 5.95 EUR and the card processing fee (where applicable), will be reimbursed. No refunds will be given if you fail to collect the vehicle at your specified time or if you fail to meet the driving license, passport, credit card or other documentation requirements outlined in this voucher. Neither do BookMyCar provide refunds for vehicles returned early. One Way Rentals between 2 different islands or cities are not permited. 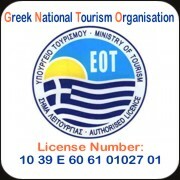 One Way Rentals are premited on the same island or Beteween Athens airport and port. Please note that each Location has different terms. Use the buttons below to see the terms and conditions of your destination.